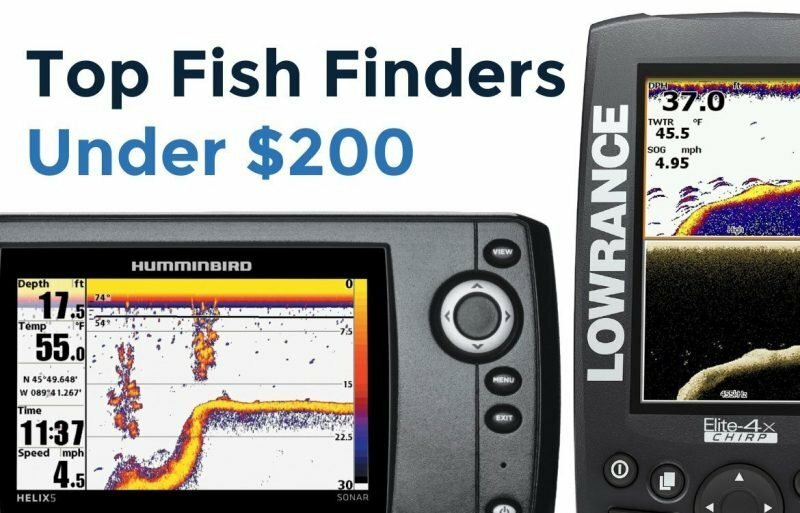 If your budget for a fish finder is “just” $200, then we have good news for you. 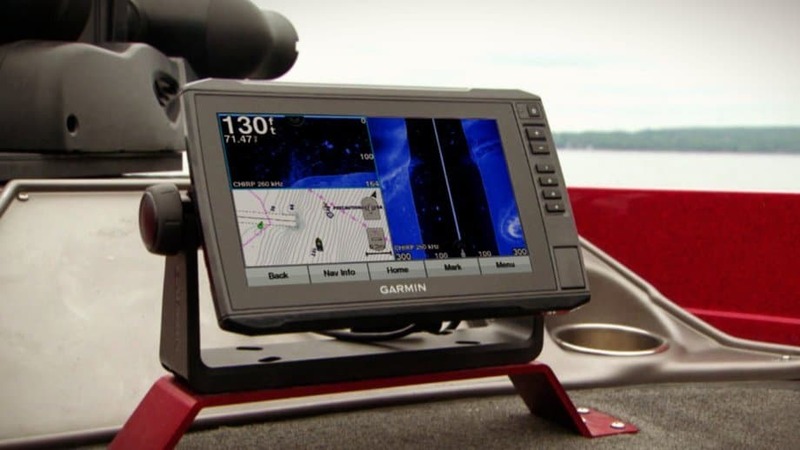 These days you are getting more value for your boating electronics dollar than ever before. You can thank the fierce competition of the Sonar Wars for that. 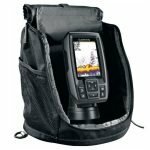 The best fish finder under $200 will have a nice full color screen in sizes ranging from 3-1/2” up to 5”, with varying pixel resolutions. 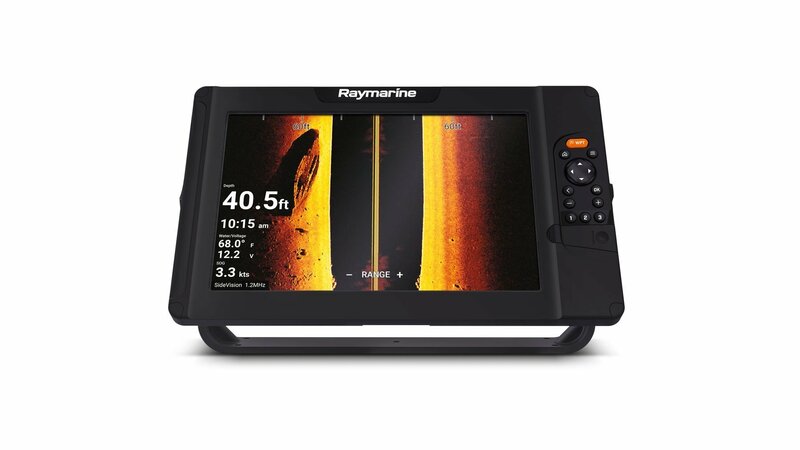 Fish finders in the $200 class will also have dual beam sonar capabilities, and some are now also utilizing advanced sonar imaging technology like Down Imaging, DownScan, and ClearVü/DownVü. Here are our picks for top fish finders under $200. There is quite a bit of variation among these units, so you have to weigh what is most important to you for fishing. Do you want the biggest screen possible? 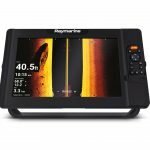 Or is having down imaging and CHIRP sonar the most important you? 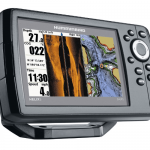 Also be sure to consider whether you want or need GPS to make waypoints of your favorite fishing spots. The new Striker Plus 4cv from Garmin is an intriguing option in the under $200 range. The 4cv features a 3.5 inch display, which is small, but makes up for it with a nice pixel count of 480×320 and bright HVGA colors. This is a pretty nice screen when compared to the Lowrance Hook-4x that has 480×270 pixels in a 4.3 inch screen. The Striker Plus 4cv has all the sonar options you could need with 2D, ClearVü (DownVü), and CHIRP sonar all packed inside this powerful little unit. Within those sonar options, the 4cv supports a wide array of frequencies. Using traditional sonar you have ability to use Dual-Beam 77/200kHz for different cone coverages. CHIRP ClearVü has 455/800 kHz coverage which provides excellent deep and shallow water performance. Finally, with Garmin’s CHIRP sonar you have the ability to see Mid an High range CHIRP bands with the included GT20-TM transducer. What’s great about the Striker Plus 4cv is that it also includes GPS capability, a feature the other units in this price range have not matched. While you don’t get the lake mapping capabilities of more expensive fish finders out there, you do get the huge ability to drop waypoints on any place of interest you find during your fishing outings. Now you can return to your hot fishing hole any time you want. The Hook-4x CHIRP is new this year, and is a surprisingly powerful fish finder for its size. The Hook-4x CHIRP has a 4.3” screen, with 16 bit color, LED back-lighting, and a resolution of 480×270 pixels, which is OK but not in the same class as the Helix 5. The sonar capabilities are the main selling points for this fish finder. 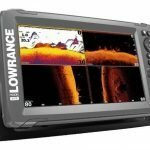 It boasts both CHIRP sonar and DownScan Imaging, that can be viewed in a split screen, or with the Lowrance exclusive DownScan Overlay mode. CHIRP sonar is said to improve target separation on the screen, especially in deeper water situations. DownScan Overlay is a handy feature that combines the best of both 2D and DownScan sonar. 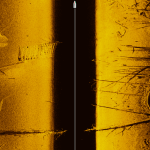 The result is a hybrid picture that takes the structure revealing ability of the DownScan and overlays it with the 2D sonar to help distinguish fish and objects within the same screen. 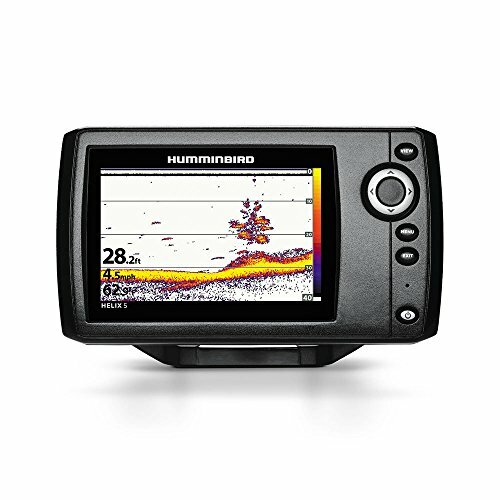 The Helix 5 G2 is a brand new series from Humminbird, which we already reviewed in depth. In its short existence, this series has proven to be an extremely popular seller. It’s easy to understand this, once you take a look at the screen specifications. At a resolution of 800×480 pixels and 5” size, this screen has 3 times the number of pixels as comparable units. Sonar looks fantastic on this new display from Humminbird, especially in the widescreen layout. In addition to the bright new screen, you get the XNT9 20 T transom mounted transducer, which outputs an 83/200kHz Dual Beam sonar, and temperature to the unit. The Helix 5 Sonar unit boasts a target separation of just 2.5”, making fish stand out from the bottom and from weeds and brush. The Helix series comes with a solid gimbal mount bracket, just like the expensive fish finders. Anglers have some great options to choose from in the “Under $200” category. You have low cost down imaging, and bigger and brighter screens than ever before. In order to narrow your options down, think about what features are most important for how you like to fish. 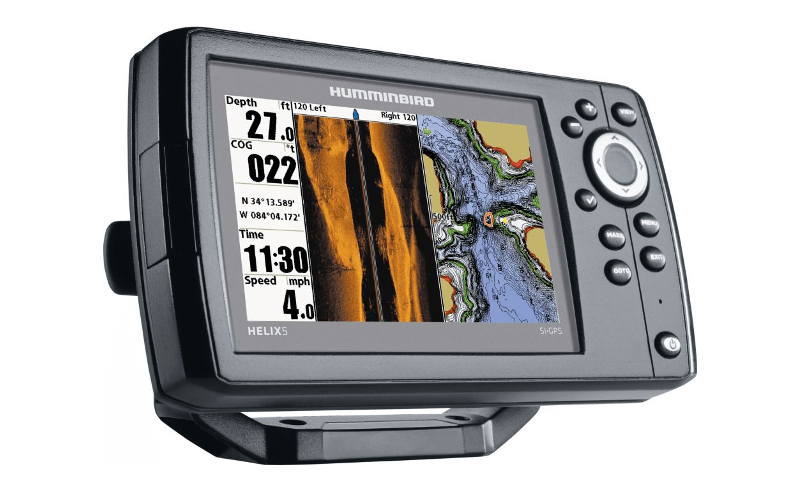 For Larger Screen + Higher Resolution >> Choose the Helix 5 Sonar G2. The 5” screen is very bright, and has 3 times the number of pixels as the other units we just compared. 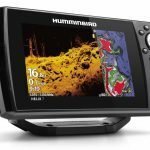 If you need a fish finder with solid sonar performance, and one that is easy to see, than the Helix 5 Sonar is a great option. For Sonar/DownVu/GPS >> Choose the Garmin Striker Plus 4cv. 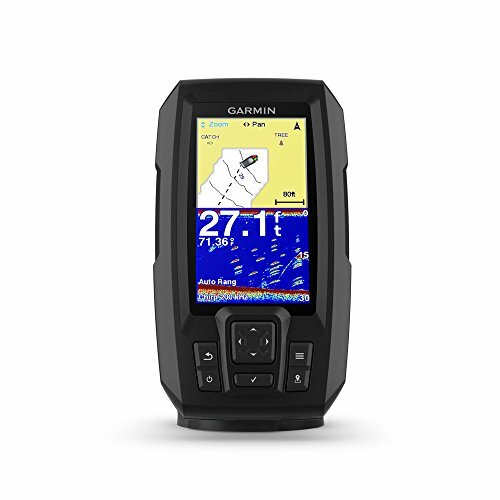 This unit is capable of displaying traditional sonar and ClearVu, either in split screen or in full screen mode, making this fish finder a powerful little unit. 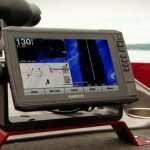 CHIRP sonar claims to be the next big thing in fish finder technology, and this is the only unit less than $200 that has it and GPS capabilities. 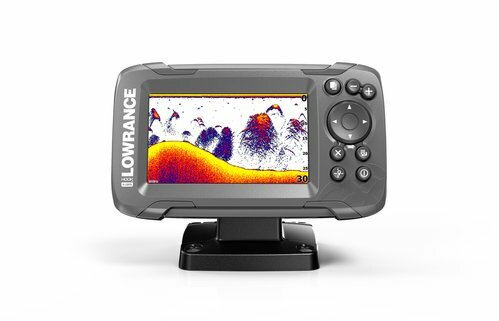 For Down Imaging >> You will have to choose between 2 models, the Lowrance Hook2 4x, and the Garmin Striker 4cv. The Hook-4x has a bigger screen, but the Striker 4dv has a better resolution. While they have both regular sonar and down imaging sonar, we give the nod of approval to the Striker Plus 4cv because it has Live Mapping built in. If you want to compare and search for similar fish finders, try our Fish Finder Comparison Tool. I fish from an inflatable Hobie 14it kayak and want to add the Hummingbird Helix 5 to my kayak. Would the Helix 5 be a good choice? Yes it would be a fine choice. It has a pretty solid screen for a smaller unit.